Israeli PM Benjamin Netanyahu says he expects European countries to follow the US in recognising Jerusalem as his country's capital. He is in Brussels for talks - the first time an Israeli prime minister has visited the city in more than 20 years. But the EU's foreign policy chief, Federica Mogherini says the bloc's stance on the matter is unchanged. Donald Trump's move has left the US isolated on a highly sensitive issue between Israel and the Palestinians. Arriving in Brussels, Mr Netanyahu again welcomed the announcement, saying Jerusalem had been the capital of the Jewish people for 3,000 years and Mr Trump had put "facts squarely on the table". "I believe that all, or most, European countries will move their embassies to Jerusalem, recognise Jerusalem as Israel's capital and engage robustly with us for security, prosperity and peace," he added. 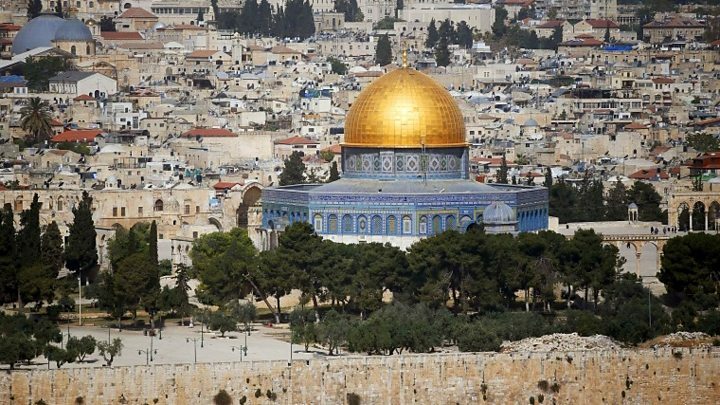 As well as recognising Jerusalem, President Trump also said he was directing the US state department to begin preparations to move the US embassy from Tel Aviv to Jerusalem. How are capital cities chosen and what do they represent? 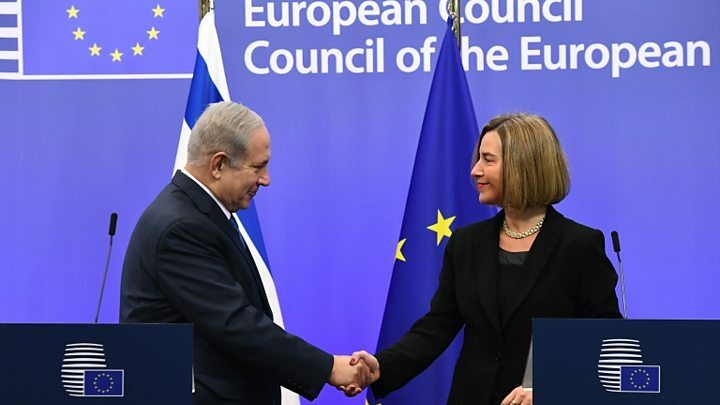 But Ms Mogherini said the EU would continue to recognise the "international consensus" on Jerusalem. "We believe that the only realistic solution to the conflict between Israel and Palestine is based on two states with Jerusalem as the capital of both." She also condemned "all attacks on Jews everywhere in the world". Before heading to Brussels, Mr Netanyahu met French President Emmanuel Macron in Paris, who urged him to freeze settlement building and to re-engage with Palestinians. Mr Trump's announcement drew worldwide condemnation and sparked protests which continued for a fifth day on Monday. In the West Bank city of Ramallah, Palestinians lobbed stones at Israeli security forces while Lebanese people have been taking to the streets of Beirut.